Vice Media journalist Ben Makuch arrives at the Supreme Court of Canada in Ottawa, on May 23, 2018. The Supreme Court is weighing the need to give greater protection to all journalistic sources — and not just confidential ones — after hearing a case that pits the federal government against a reporter who interviewed an alleged Islamic State militant in 2014. Vice Media Canada Inc. appeared in front of Canada’s top court on Wednesday in a bid to strike down a production order obtained by the RCMP in 2015. 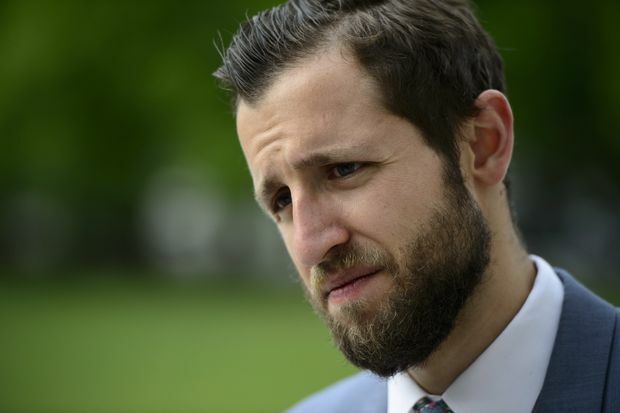 The judicial authorization called on journalist Ben Makuch to provide the police force with all documents related to his contacts with a man believed to be Calgary’s Farah Mohamed Shirdon. Vice Media is not arguing that Mr. Shirdon was a confidential source, given that Mr. Makuch wrote three stories on his interviews with the man known as Abu Usamah. Still, the media group said there will be a “chilling effect” if people involved in potentially illegal activities fear their comments to a reporter will be used against them in court. “This case involves conscripting the media as, in fact, the investigative arm of the state,” Mr. Tunley said. The CBC intervened in the case to argue that all sources need to be protected in Canada, and not just those who speak to reporters on the condition of anonymity. Parliament adopted the Journalistic Sources Protection Act last year, which aimed to shield confidential sources from police investigations. “The law may unintentionally result in an over-reliance on confidentiality by creating a two-tier system that grants more protection to confidential sources than to non-confidential sources,” said CBC lawyer Sean Moreman. Federal lawyer Croft Michaelson countered that the RCMP was fully within its rights to obtain a production order to have access to Vice Media’s material as part of its criminal investigation against Mr. Shirdon. The man was charged in absentia with six terrorism-related offences in 2015. Mr. Michaelson said the media is not entitled to “additional procedural requirements” when a judge approves a production order against a news organization. He added journalists do not have special privacy rights that would go beyond the rights that Canadians enjoy in their bedrooms, for example. “The newsroom should not be entitled to more protection than the most sensitive part of human society. We all have rights to privacy and there is always a balancing of interests that has to be taken into account,” he said. The questions from the Supreme Court judges throughout the hearing were mostly related to the need to force lower-level judges to give more weight to the rights of journalists before they approve production orders against media organizations. Mr. Michaelson acknowledged the Supreme Court could modernize the test used to determine whether a production order used against a media organization is actually in the public interest before it is executed. Mr. Makuch said that journalists should not have to provide their source material to police, stating the RCMP case has hurt his ability to win the trust of potential sources. Reporters Without Borders, a non-government organization that generates the World Press Freedom Index, said Canada needs to provide greater protection to all journalistic sources. Canada is currently in 18th place on the index. “It’s not just a fact that a source is confidential that merits an arm’s-length relation between police and the media,” said Margaux Ewen, the group’s executive director for North America.